…and why is McDonald’s bringing back Filet-o’-Fish advertising now? Well, they sell 40% of their fish sandwiches each year during the Lenten season, and the Golden Arches are just fishin’ while the fishing is good. And I’ll bet that some of you owned a singing Billy Bass fish on a plaque, or knew someone who did. The ones I most encountered sang Take Me To The River, which memory is already playing inside my head…good song, but make it stop! Giant Purple Blobs Invading SF Bay! Vintage science fiction movies cautioned us to “Watch the skies!,” but perhaps they better could have advised us to watch the seas, because you never know what’s gonna wash up. 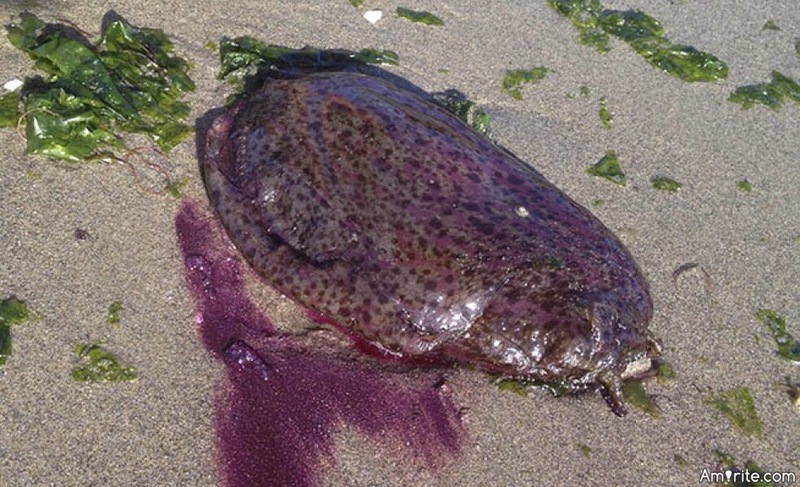 Submitted for your approval is one such example, a large purple blob of the type that has washed ashore along California, even in San Francisco Bay. …and isn’t Invasion of the Giant Purple Sea Hares a SyFy Channel movie that begs to be made?! 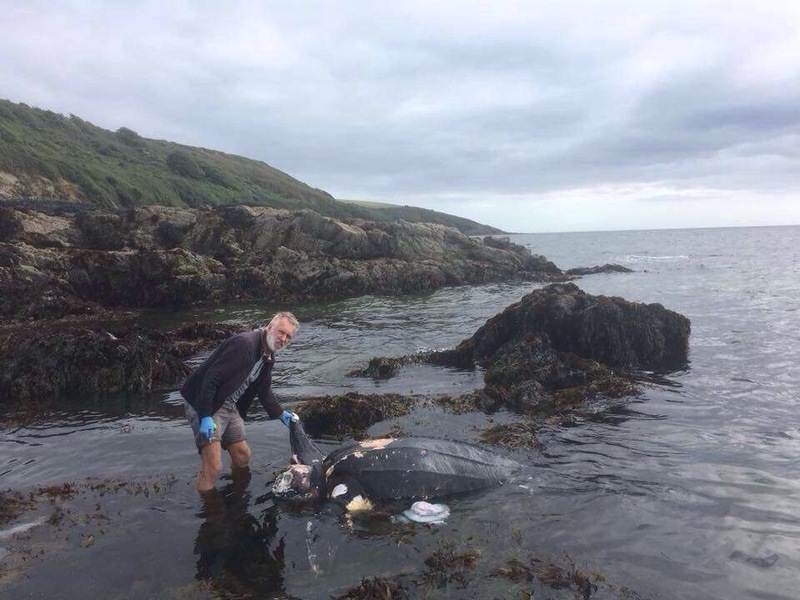 Continuing our series on disgusting dead things washing up on beaches, we present you with this image of a large leatherback turtle that washed up off the shore of Cornwall, England. I’ve spared viewers a more graphic view taken frontally in light of the, err, decomposition. The sea turtle was said to be the size of a small boat, and was estimated to be perhaps 100 years old in light of its size. One might well ask, “What happens to large sea creatures when they die?” Well, many of them sink to the depths where they provide a banquet for a variety of sea life both large and small; nature wastes nothing. Gases of decomposition can provide buoyancy to other deceased sea creatures, however, depositing some on our beaches. Now the tabloids might spin the story differently, something along the lines of “Zombie Sea Turtle Attacks Britain!” I don’t think that it was Gamera. I doubt that the rather classy gent in the picture poked the poor deceased turtle with a stick, although he is wearing striking if sensible blue rubber gloves, all the while demonstrating that older guys can still look good in shorts. And the elemental landscape and brooding sky makes for a memorable picture…ahh, to be in England! Sea Creature Washes Up On Russian Beach! We always get terribly excited here at Foxsylvania when any kind of globster washes up on any beach, anywhere. Set up some food stands and a good band, and you’ve really got something to break up the summer doldrums! …the “sea monster” in question is described as being smelly and hairy, and at least three times the size of an average human. It washed up on the shore of the Bering Sea on the Pacific side of the Kamchatka Peninsula; from Russia with Love, Darlink! Although the unidentified thing appears to be from an animal with gray and white coloring, it lacks a defined head or other body parts other than a possible tail or tentacle. The creature is covered with tubular hair, which is hollow and similar to that found on a polar bear. Some have speculated that the carcass could be the remains of a wooly mammoth that had washed up as glaciers thawed, while others suggest that it could be from an octopus or giant squid. The most likely theory, however, is that the carcass is indeed a globster, a term coined in 1962 to describe something that is not a complete animal, but rather the decaying parts of sea animals such as whales or sharks. Under the influence of time, the sea, and post-mortem predation, the remains of large sea animals often take on bizarre and unrecognizable forms.